This year, the Blue Devils should be as freshman-heavy as John Calipari's most extreme Kentucky rosters, and fittingly they'll get their first national exposure against the Wildcats in the Champions Classic. What does it mean that two of college basketball's marquee programs have seen a convergence of philosophies? The college basketball career of Kyrie Irving lasted all of 11 games, but it foreshadowed one of the sport’s most impactful developments. Irving, a top-three high school recruit in the Class of 2010, starred immediately for a Blue Devils team that entered that season ranked No. 1 in the country, but in his eighth game, the combination of an awkward landing and a birth defect in his right toe resulted in torn foot ligaments that sidelined him for three months. Irving returned for Duke’s first NCAA tournament game and helped his team reach the Sweet 16. Then, in April, he announced that he would enter the 2011 NBA draft. In a press release, Blue Devils coach Mike Krzyzewski said, “Our whole program is overjoyed with having Kyrie here for one year and that he has the chance now to pursue a dream of being a high draft pick and a great player in the NBA.” That June, the Cavaliers selected Irving No. 1 overall. The saga was unusual in its own right: Never before had a No. 1 pick who played college basketball played so little of it. But for the player in question to have come from Duke? That was unheard of. In Krzyzewski’s previous 30 seasons at the school, only two of his players—Corey Maggette (in 1999) and Luol Deng (in 2004)—had bolted for the NBA after playing just one season for him. In fact, Blue Devils players leaving early for the NBA at all was once so contentious that Elton Brand’s departure after two seasons, in ’99, sparked an infamous written exchange with a disgruntled alum. Krzyzewski had even prevented a banner for Duke’s 1990 Final Four run from being hung in Cameron Indoor Stadium until all of that team’s seniors had received their degrees, which meant it wasn’t raised until 1999. Now, on the dawn of the 2018–19 season, Duke’s shift over this decade—from the program that sat out the one-and-done era to the program that has mastered it—appears to be reaching its zenith. The Blue Devils enter the year with three of the country’s consensus top-four recruits (forwards R.J. Barrett and Zion Williamson and guard Cam Reddish), plus 13th-ranked Tre Jones and 37th-ranked Joey Baker. 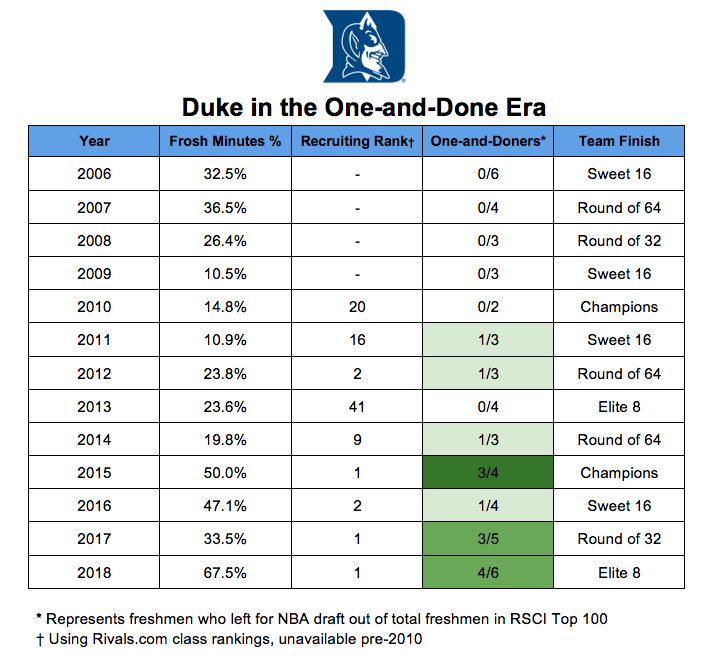 Barrett, Reddish and Williamson are all projected to be among the top picks in next June’s draft, but regardless of when they turn pro, given Duke’s dearth of high-usage returnees, those three and their classmates are likely to make history. As Krzyzewski’s change in philosophy has increased both roster churn and the level of incoming talent, the team he fields this year may be among the most freshman-heavy we have ever seen. It’s fitting then that the group’s non-exhibition debut will come against Kentucky, the program that under coach John Calipari first became synonymous with the one-and-done phenomenon and testing the limits of how strongly a team with a freshman foundation could contend. Five years ago, the Wildcats entered the 2013–14 season ranked No. 1 in the polls as a team that would be Calipari’s most freshmen-driven yet, with four such newbies in its starting lineup and another three playing regularly off the bench. Freshmen wound up playing 75.9% of the Wildcats’ minutes that season, blowing past the 68.5% mark set by Michigan’s Fab Five in 1991–92. Last year Kentucky surpassed even that, with freshmen playing 81.2% of its minutes—and for the first time Duke nearly also relied more on freshmen than that famed Michigan team, with 67.5% of the minutes going to frosh, up significantly from its previous high of 50.0% on that ’15 title team. It is clear, looking at the data, that the general narrative about the two programs is correct: Calipari has been tapping the one-and-done well since he arrived in Lexington from Memphis before the 2009–10 season, and after a few selective trials, Krzyzewski has shifted toward being open to the same model. In the last four seasons, in fact, 11 of Duke’s 19 top-100 freshmen have left for the NBA after one season, compared to 12 of Kentucky’s 20—a virtually identical rate of one-and-donery. Kentucky had a stranglehold on the top spot in the recruiting rankings until that same period, during which Duke has frequently relegated it to runner-up. It’s also notable that the teams’ success in that span is nearly indistinguishable: both have ended their seasons once each in the Round of 32, Sweet 16, and Elite Eight, while in the fourth season of the period Duke won a national championship and Kentucky lost in the semifinals. Memorably, these finishes came in the same season, as a 38–0 Wildcats team lost to Wisconsin in the Final Four, before those Badgers fell to the Blue Devils in the final. Both Kentucky and Duke have obviously enjoyed great success even with freshman-heavy teams. But what has often been the case, as one might expect when so many key players make the leap to the Division I level simultaneously, is that these teams have struggled for stretches before turning things around. The most drastic set of highs and lows came from what had been, until last season, the most extreme example of freshman reliance we had seen: 2013–14 Kentucky. Duke’s youngest teams have endured similar unevenness. The 2014–15 title team, Krzyzewski’s first to feature multiple one-and-dones, dropped three games in January, including back-to-back dates with NC State and Miami in a three-day span, before losing only once the rest of the way. The following January, the Blue Devils lost four games in 12 days, then four of seven to enter the tournament, where they reached the Sweet 16. Last year—with freshmen playing the biggest share of minutes yet—Duke was an overtime period away from reaching the Final Four, but only after having lost three of four midseason, including to lowly St. John’s. Like during the 2015 title run, the primary culprit last season was a defense that often looked disjointed and seemed to regress at inopportune times. Thankfully that ’14–15 season inspired the experimentation needed to find the blueprint for a solution. 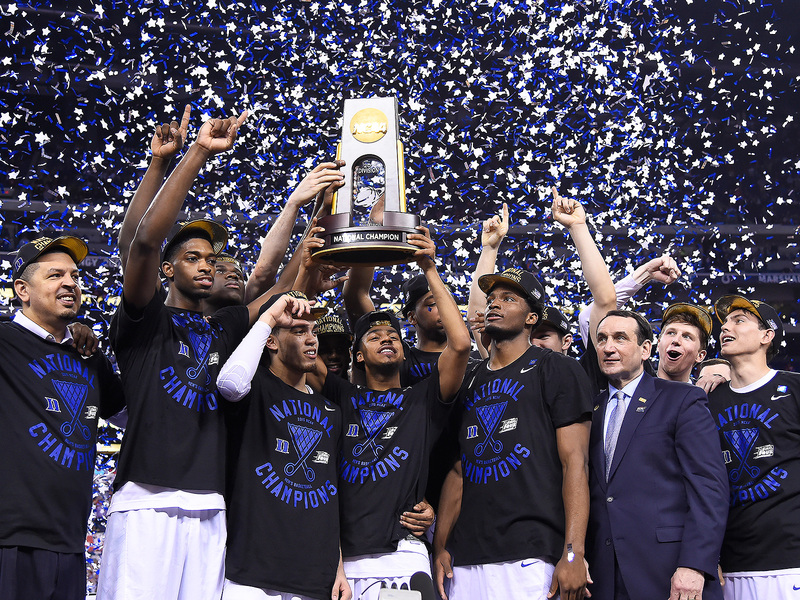 The lasting narrative of Duke’s 2015 championship was Krzyzewski adapting. For one, there were all those first-year players featuring so prominently—at one point during the championship game, the Blue Devils had four freshmen on the floor—a far cry from the senior-laden squad that delivered Krzyzewski his last title five years earlier. Also shocking was how Duke was winning: with a zone defense. For decades such a thing would have been inconceivable in Durham. Krzyzewski’s teams were nearly as synonymous with floor-slapping man defense as they were with evoking opposing fans’ scorn. But after his team lost for the second time in three days in January 2015, Krzyzewski proved both desperate and flexible enough to rethink things. The Blue Devils began mixing a 2–3 zone into their game plans, started defending and started winning—then won it all. Last season the story played out similarly. Younger than any team Krzyzewski had coached—second only to Kentucky in inexperience weighted by playing time, according to kenpom.com—the Blue Devils again struggled defensively, eventually getting lit up for 1.19 points per possession by St. John’s and 1.26 by North Carolina in consecutive February losses. After mixing in a zone for its first 24 games, Duke then committed to it nearly full time, playing zone on 92.1% of its possessions over its remaining 14. In that time, the Blue Devils’ national ranking in defensive efficiency shot from the back portion of the top 100 to a final place of ninth. Just how much zone this season’s Duke team plays remains to be seen. The team’s exhibition games suggest that, like a year ago, the Blue Devils are likely to look to man-to-man as Plan A. But the zone is likely to remain in Krzyzewski’s arsenal, and if history is any indication, it’s a weapon he is likely to draw. O.K., this one is less about Duke’s team this year than its program going forward. But one of the effects of building around the kind of elite talent that ends up being one-and-done is that the dynamic self-perpetuates: Once this year’s crop is gone, unless you want to drop off in performance and bring in less-heralded players who are more likely to stay in college longer, you try to reload with more players who will not be long for campus, and those guys become your core because your previous stars have left, and so on. Duke has thus far landed just one commitment for the Class of 2019, five-star wing Wendell Moore, whom most outlets have ranked in the top 25; it is also considered firmly in the mix for three top-five prospects in next year’s class, and three of the top dozen or so a year later. With Krzyzewski willing and able to bring in the level of player who is making only a pit stop before hearing his name read by Adam Silver—and with the NBA G-League “select contracts” route a great unknown, and the league’s attempts to lower its age limit stalled—there’s no reason to think that Duke’s new norm will be changing anytime soon. Of course, there is the possibility that potential one-and-done talent will simply choose not to be done after one. 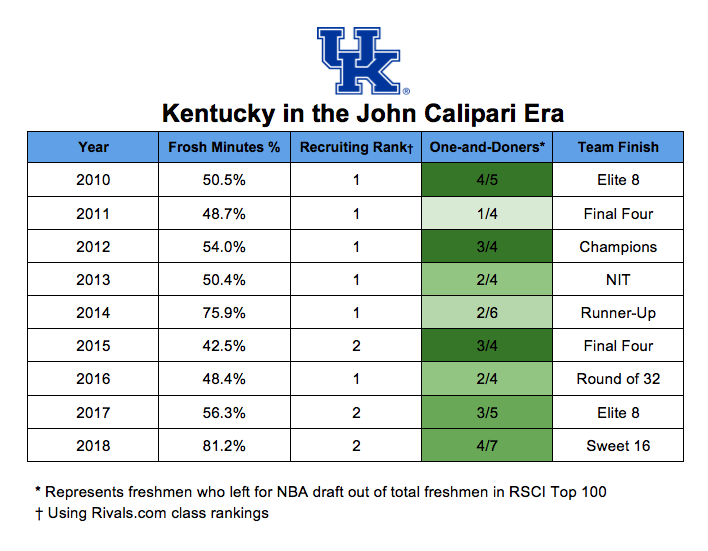 After leaning on high-level freshmen more than ever last season, Calipari will be welcoming back three of those players as sophomores this fall, which is among the reasons the Wildcats are ranked ahead of even lottery-loaded Duke. And it’s worth remembering what happened when Calipari’s 2013–14 team re-set the bar for freshmen playing time on a contender: Four of those six players returned to Lexington a year later, helping Kentucky run through the entire regular season and SEC tournament without a blemish. It was the deepest run any college team made at perfection in decades, made possible by a combination of blue-chip talent and (relative) experience rarely seen anymore. It also affirmed an old adage that’s stayed relative even as the game has evolved: that the best thing about freshmen is they become sophomores. At least, if they do.